The city of Dunedin is the capital of the New Zealandic province of Otago, and second most populated city of South Island. The green zigzag line refers to Otago's mountains and valleys, and its three tops refer to the Mounts Flagstaff (yes, a vexillologic mountain! ), Swampy and Cargill. The ram (wool and mutton) and the sheaves (cereals) represents some important economic activities of the region. The castle is inspired in the famous Edinburgh Castle, present on the flag of the Scottish city of Edinburgh, as "Dunedin" name was took from Gaelic name of Edinburgh, Dùn Èideann, and even some Dunedin streets, etc. are named after Edinburgh counterparts. The ship represents the first Scottish immigrant ships, being the foundation of the town related to Free Church of Scotland. 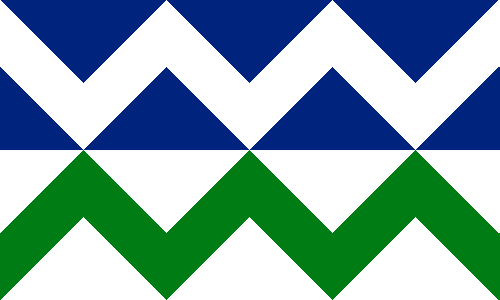 On bottom, the same zigzag lines of coat of arms, representing the mountains, valleys and the bay (where there's a port), while the blue and white is supposed to form, together with bottom part, an allusion to the Scottish saltire, a reference to Edinburgh and the Scottish founders of the city. 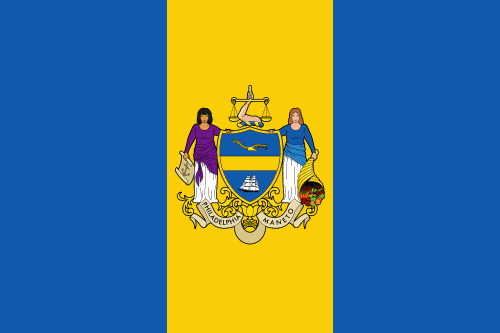 I like the result, aesthetically, but I fear that, maybe, it's a too radical departure from original flag. 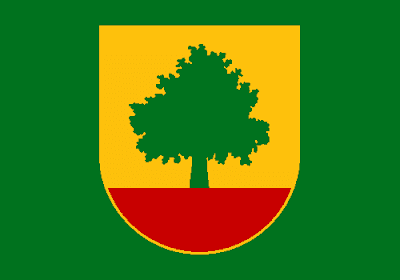 Anyway, differently of council flag, this flag could be freely flown. Comments are welcome. Feel free to comment. I'd like to wish an excellent 2014 to all, and give thanks to all the support during 2013. The Couto Misto (Coto Mixto in Spanish, Couto Mixto in Galician, Couto Misto in Portuguese) was a curious entity in Iberian history. It consisted of a stripe of lands that wasn't owned neither by Spain nor by Portugal, but, actually, a de facto independent republic, whose citizens had many privileges. It lasted until 1864. There are many proposals to revive the Couto Misto as a Euroregion, a free zone or similar. 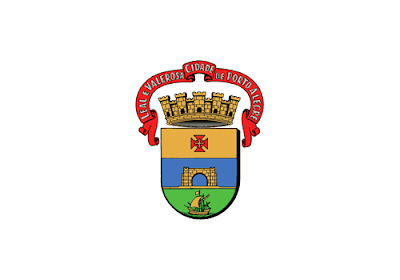 It consisted of three villages (Santiago de Rubiás, Rubiás and Meaus), that was annexed to Spanish province of Galicia, while the "promiscuous people" and a stripe of uninhabited land was annexed by Portugal. A única novidade é que a mulher de Cesário anda a costurar uma nova bandeira do Couto Misto, que a actual está mais podre do que uma árvore morta. O desenho é o mesmo de sempre: três estrelas dispostas em triângulo e no centro um brasão com três fechaduras. The only news is Cesário's wife sewing a new Couto Misto flag, because the current one is more rotten than a dead tree. The design is the same of always: three stars disposed in triangle and a coat of arms with three locks in the center. The locks are an essential symbol of Couto Misto, that relates to its politics: the laws were decided by citizens, then put on a trunk with three locks, that could only be open if the three judges (one nominated by each village, the heads of state of the Couto Misto) agreed, as each one had his own key; honorary judges are annually elected until now. 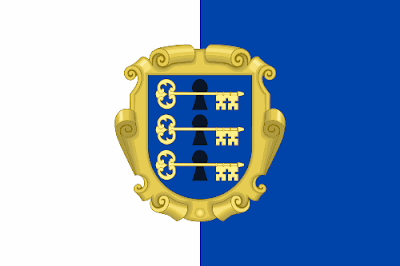 The background of the flag is based on the ancient flag of the country, with a coat of arms with three locks and three keys inserted on a Baroque-style heraldic console (as used by other microstates, like Andorra and San Marino). 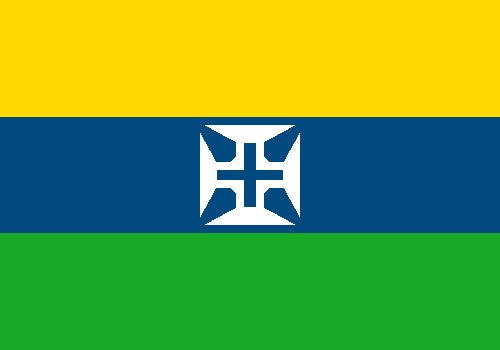 This flag could cause awareness of the history and status of Couto Misto, and could be used alternatively to the ancient flag and the flag described on the fragment above. I'd like to desire a Merry Christmas and an excellent 2014 to all readers of the blog. 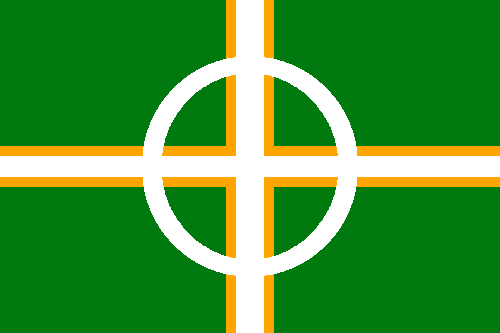 Following a request by Michal Hospodár, follower of this blog and a "netfriend", I made a first attempt to a flag representing the Yi (or Lolo) people that inhabits China, Vietnam and Thailand. I have to admit that it took some weeks before a decent idea came to me. This flag is made, in part, for scholar purposes, as ethnic flags on China are still officially banished, as far as I know. Porto Alegre is the most southern capital of Brazil, and one of largest and most important cities in the country. 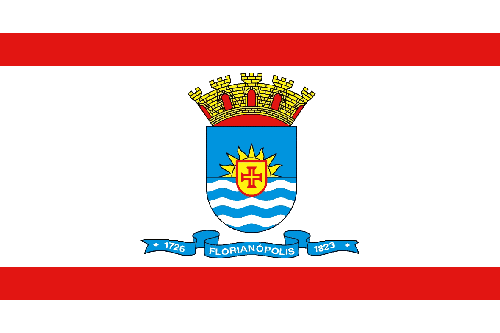 The coat of arms of Porto Alegre has a red cross on gold, representing the Portuguese settlers, as well as the Catholicism that's the main religion on the city. On blue, a golden depiction of the former gate of the city, that was always open in sign of hospitality. In green, a ship that represents the first sixty families that came to the cities, from the Portuguese archipelago of Azores. A golden mural crown with five towers represents the status of capital in Brazilian and Portuguese heraldry, and the scroll reads "Leal e Valerosa (sic) Cidade de Porto Alegre" (in English, "the most loyal and worthy city of Porto Alegre"), title gained during the Empire for keeping loyal during secessionist attempts in the state of Rio Grande do Sul. 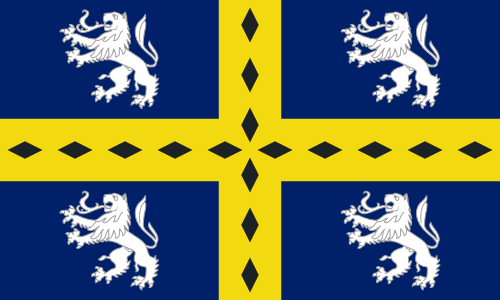 The plain yellow-blue-green stripes are a beautiful and rarely used design (at least I can't remember similar design), but, to make sure the flag is unique, I added the cross of the coat of arms. I kept it blue and white, in reference to the flag of Azores, a reference to the foundation and early years of the city. There are only six remaining cities on the capital series. Wait the next chapters! 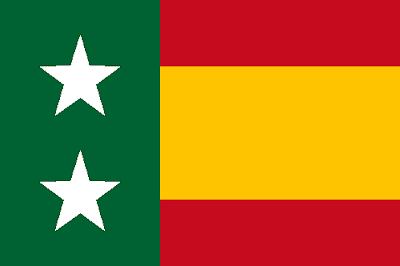 Last week, Samuel McKittrick released, on his blog, an excellent post about an Iberian peninsular flag. 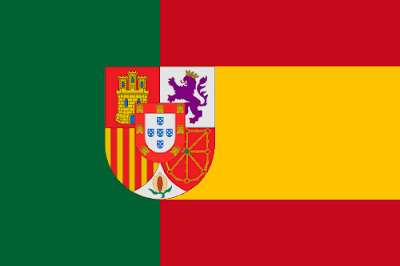 Although it's unclear if European Union is good or bad for a future federation or confederation between Portugal and Spain, being Latin American, I'm personally favorable to stronger ties between the two countries, specially in cultural aspects. 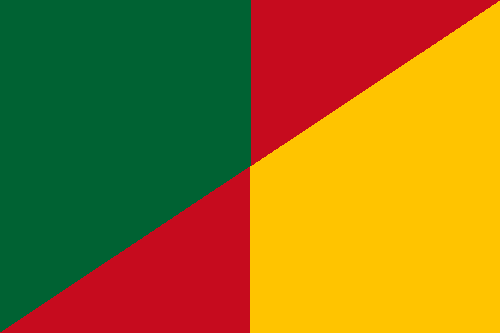 Proposal by Sinibald di Mas i Sans (1854), with the colors of Portugal coat of arms (blue and white, also used in then flag) and the colors of Spanish flag (red and yellow). Proposal #1 by Samuel McKittrick, with the union of both Spanish and Portuguese flags, and coat of arms of Spain with Portugal in highlight position. Proposal #2 by Samuel McKittrick, with the union of both Spanish and Portuguese flags, and two stars for the two countries. This design is inspired by Union Jack and other similar designs. The blue cross on white was the first coat of arms of Portugal, and survives on current coat of arms of that country. 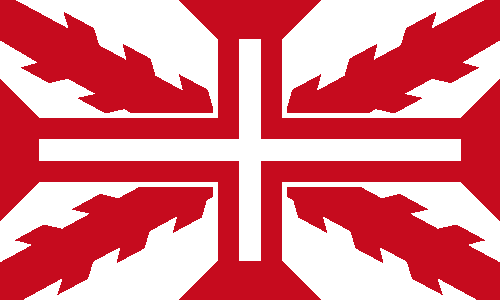 The knotted (said raguly in heraldic language) red saltire on white is the famous "cross of Burgundy", used as merchant ensign (specially in former Spanish America), among other uses, and still present on the personal coat of arms of Spanish monarchs. I also made versions with the cross of Order of Christ in red and blue. Don't forget to visit Sammy's post here. 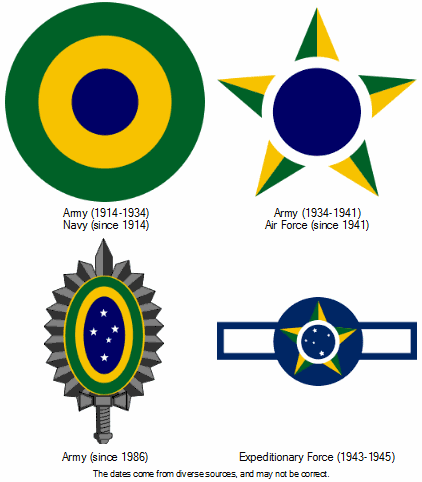 I'm very busy this week, so I decided to make drops about the aircraft roundel of Brazil, or more specifically about the question "What if Brazil had only one roundel?". There isn't something like a single unified roundel on Brazil. 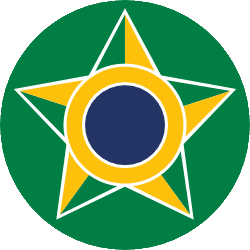 The original roundel of Brazil, inspired by national cockade, is used on navy's aviation. 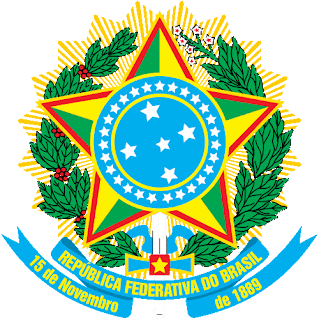 The air force itself use one design inspired on Brazilian coat of arms. The army's aviation use the insignia of the Army on the wings of its airplanes. 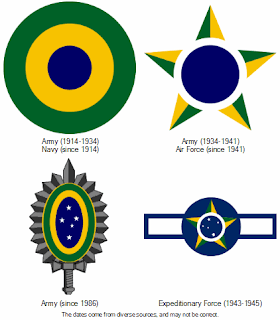 A fouth roundel was also used on Brazilian history: the Brazilian Expeditionary Force, that represented the country of World War II, used a design inspired in USA roundel, to help the identification between the Allies, and this design could be reused on a future war. The colors of the roundel will be theme to next drops. Wait it! 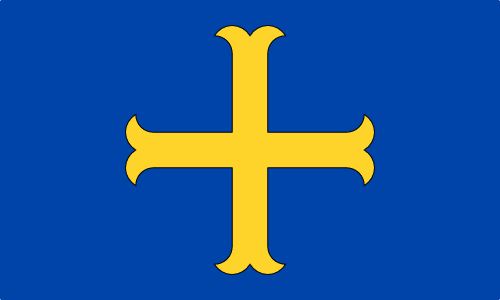 I recently knew about a unofficial campaign to the adoption of a flag to the city of Gloucester. I've sent my proposal to newspaper, hope they'll publish it. 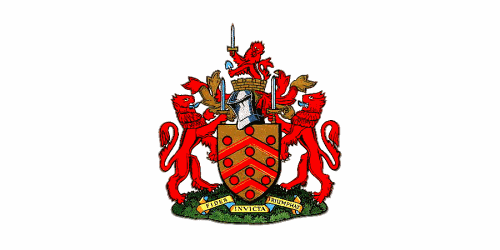 After research, it seems that city's coat of arms is inspired by the arms of De Clare family (that were the original earls of Gloucester), with torteaux (heraldic term for red roundels) believed to come from the arms of the see of Worcester (although a separated diocese of Gloucester exists since 16th century). My design arranges the three chevronels of De Clare in more traditional way, putting the red torteaux on remaining space (many arms also inspired by diocese of Worcester's also use less torteaux). It's still recognizable, but it's much more adequate to flying on a flag, as it's easier to be hand-made and can better be distinguished on high wind (the council's reported flag could be confused with any other white flag with a coat of arms on it). My design is not copyrighted, and fits the recommendations of British Flag Institute. Sorry for the slight delay for posting this week. 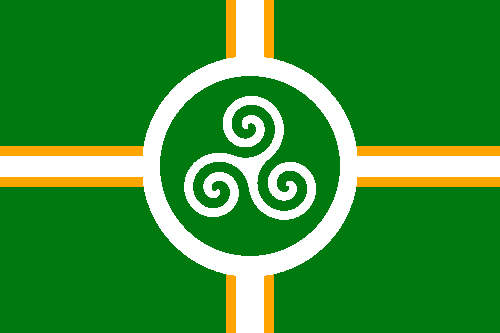 A thread on Flags Forum gave me the idea to resurrect an old sketch I made to represent the Celtic League but de facto all the pan-Celtic movement i.e. the supporter to bigger contact between the "Celtic nations". This flag is made with the amalgamation of flags of seven Celtic nations, from top left, in clockwise direction: Galicia, Ireland (in this case, not only the Republic of Ireland, but in a pan-Irish context), Scotland, Cornwall, Isle of Man, Wales and Brittany. 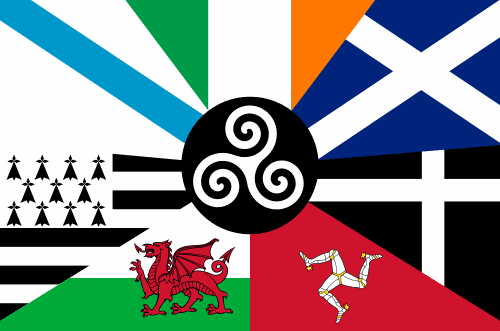 Other common variant have only the six original celtic nations, removing Galicia. In the center, a triskelion, a motif common in celtic art. 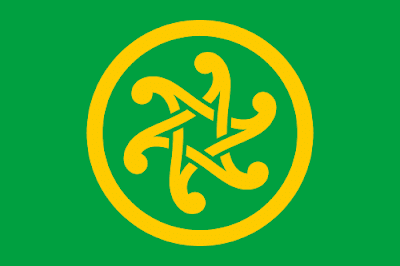 This flag have green and golden yellow colors, commonly associated with the Celts, and two conjoined triskelions (in the style of a celtic knot), representing three Gaelic peoples - Scot, Irish and Manx - and three Brittonic peoples - Welsh, Cornish and Breton. It's very much like the anterior flag, with the exception that a white triskelion was added on the center of the flag. As you can see, the designs don't have any very original approach, but I think them may work well. I've been making the last posts trying to fix the issue of multiple blank lines, specially on cell phones. Comment if it still appear on your browser. 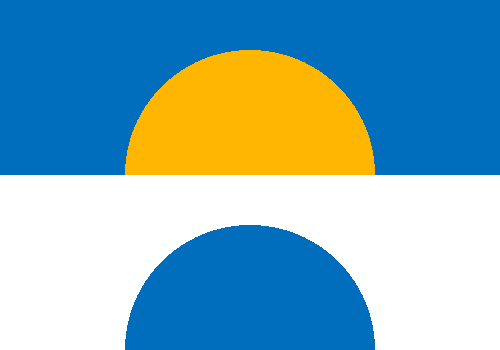 Neighborhoods are a common wondering by flag designers [see examples]. The mine haven't a flag, although others in my city do. I had an almost clear idea about what it should be, but it's the first time I "formally" design a flag to it. I live in a neighborhood (I'll translate "bairro" as this, although "borough" also sounds adequate) called "Cidade Patriarca" (translating, "Patriarch's City"), a proletarian neighborhood in the suburbs of São Paulo, yet too young: it was officially founded only in 1948, when a train station was inaugurated. 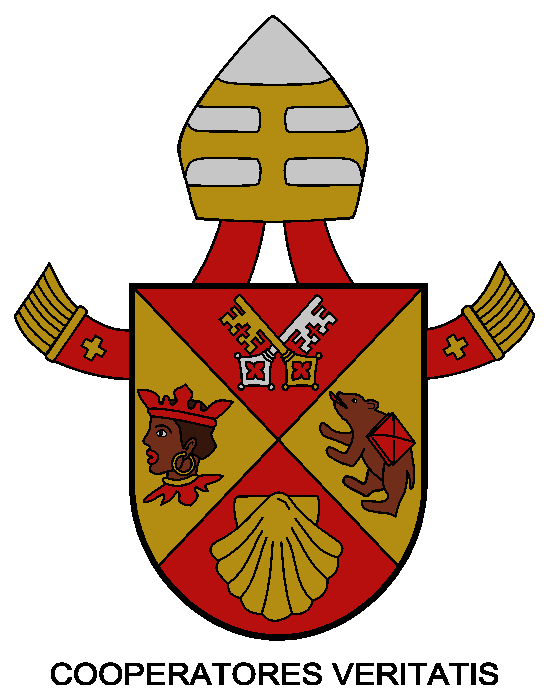 Firstly, I'd like the arms to be partly canting, making a tribute to the José Bonifácio, the "patriarch of independence", in effect to his importance in this event. So the flag is green and yellow (more details below). In fact, the anniversary of the neighborhood, September 7th, is also the date of Brazilian independence, and the public schools of the bairro are named after José Bonifácio and the viscount of Cairu (other important politician of the independence time). It also should have an tree, as one of its key characteristics was being planned (what's an exception), and the large green areas and wide streets are still visible in the landscape. Other feature should be the red color, a reference to the red clay that existed before the region was totally paved: it's very remembered by the oldest inhabitants of the region, specially about how the shoes and pants hems were ruined by red mud after the rains! Curiously, I once heard that there was a local football team called "Patriarca FC" (or something like this) whose colors were red (actually, maroon), white and green. Although all designs are good, I think the third is the most appropriate. All of them are based on principles of Portuguese vexillology, followed in many parts of Brazil, but simplified to a more striking effect. 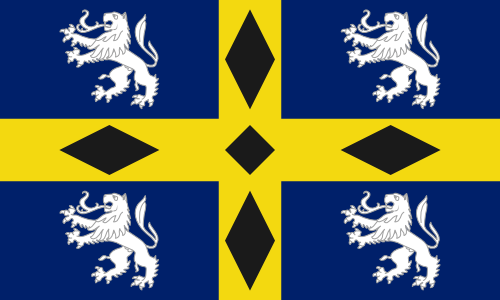 What about design a flag for your local community? If you do it, post a link on the comments. It's the 100th post of this blog! 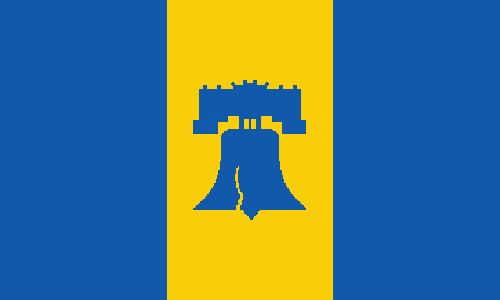 I was thinking in doing a commemorative post, but I read an article about the necessity of a new flag for Philadelphia, so I decided to give a try. 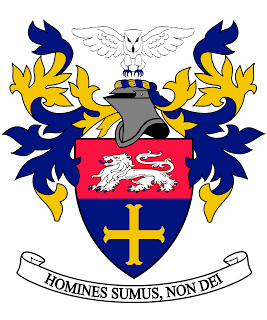 The problem of Philadelphia coat of arms is its complexity and being, in some opinions, "dated". I really like flags with ships, but I tried to avoid the comparison with Boston, specially because of color scheme. After thinking about the substitute for the coat of arms, I decided for the Liberty Bell, supposed to being rung during the reading of US Declaration of Independence. It's also connected to the fact that the city was an early capital of the USA and one of its most notorious citizens: Benjamin Franklin! 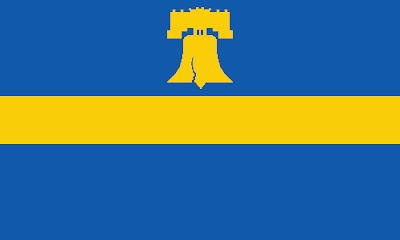 It's even used by the city's baseball team, the Philadelphia Phillies. I like this flag, for its simplicity and for keeping the base of current flag. For a similar attempt, look at the link. I appreciate the idea of the stylized keystone on the top of the bell. In occasion of the 100th post, I'd like to thank the readers, subscribers and commenters of this blog. Thank you very much. 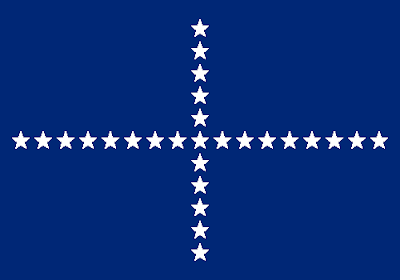 Last week, Samuel McKittick posted on his blog two proposasl to a new flag for the US Virgin Islands. The premise of the proposals by Sammy is very well-thought: before being an American territory, the US Virgin Islands were part of the Danish West Indies. 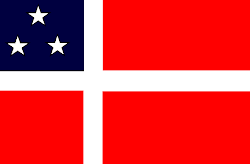 His first design is the Danish flag, with three blue stars on a navy blue background (reference to USA flag) representing the three main islands. His second proposal uses light blue (more similar to the flag of Danish West Indies) and yellow, representing the bananaquit, the national bird of the islands. 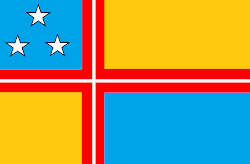 Firstly, I changed the star arrangement, to be more similar to the map of the islands and heraldically more traditional. The idea behind this design is to make the Danish flag emulated red and white stripes i.e. 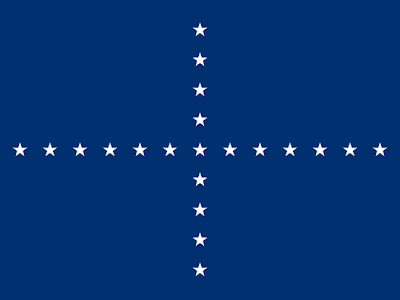 the flag of United States, representing the former and the current owners of the islands once. 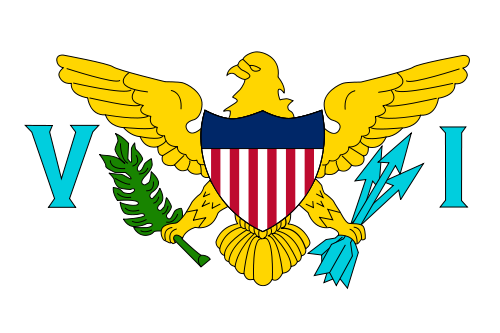 This design has a much more subtle reference to American flag, what can be a potential fault, but adds local significance and the Caribbean flags' colorfulness. Samuel McKittrick's post is very complete and explains more detailed the rationale of his designs. Click here to read it. 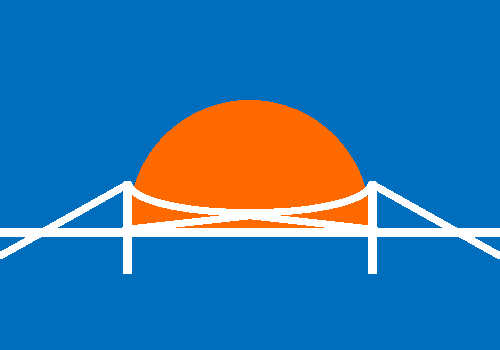 Continuing the series where I re-design most of Brazil capital cities flags, we reach Florianópolis today. The city, capital of Santa Catarina, have the third best HDI (Human Development Index) of Brazil, and the best among the capitals. The city is also a popular touristic destination. 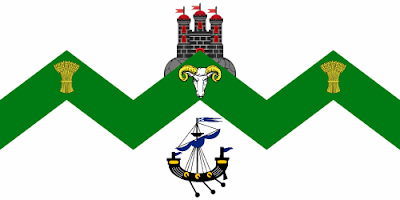 The city has a very nice coat of arms, that could make a great banner of arms. It may be, however, too generic to a flag. For this reason, I'll try a different approach. 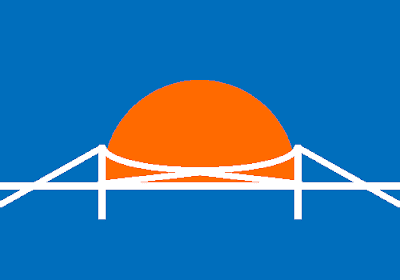 Florianópolis "postcard" is the Hercílio Luz bridge, posthumously named after its campaigner. It's the biggest suspension bridge of Brazil and, in the time of its inauguration, in May 1926, the fifth biggest in the world. It's closed to traffic since 1991, although it's still a famous touristic attraction, and has a special place in city's history: the physical link between mainland and Santa Catarina island (where the city is located) was fundamental to make Florianópolis a viable capital. I still slightly prefer the design #1. I want to know: what's your favorite? Don't forget to answer the poll: what's your favorite between the two designs I presented today? This week I was too busy, so I couldn't post anything in blog. Just for don't go blank, here's a design for an alternate jack of Brazil. This flag was adopted in imperial times, when a new star was added to the flag every time a new province was created, always keeping the cross layout (inspired by the Southern Cross). With the proclamation of republic, each province became a state in own right, but the jack isn't changed since then. This way, while the country has 27 states, the flag still have 21 stars. The construction sheet of the flag is very simple, and I can provide it if necessary. Next week, I hope the posts frequence to be normalized. Months ago, I published, on Flags Forum, a draft for a new coat of arms of Brazil that, different of the current one, follow the heraldic practice. After some corrections and additional research, I present it to you. The shield is a composition of the arms of the Kingdom of Brazil (the armillary sphere being later used by other Portuguese colonies, and by Portugal itself) with four white stars in cross, representing the Southern Cross. White stars on blue can represent a large symbology related to Brazil: the naval jack, the current coat of arms, the Order of Southern Cross in its imperial and republican versions, etc. The coffee and tobacco branches are used in both the imperial and current coat of arms. The red lace can remember the etymology of Brasil: "of flame-color". 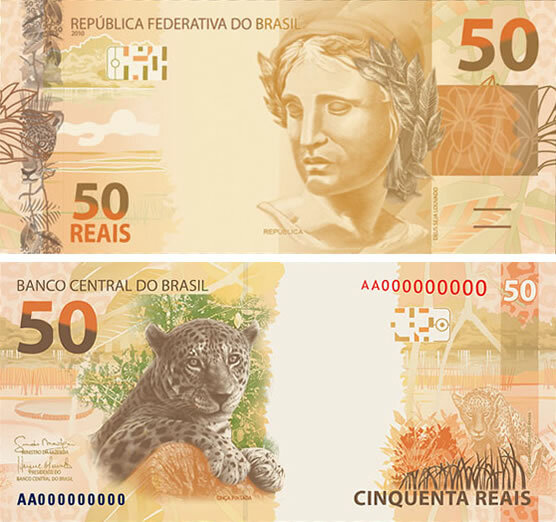 The supporter of the dexter in a jaguar (Panthera onca), the biggest feline of the American continent (and the third of the world, after the tiger and the lion), present, for example, in the 50 reais banknote, holding a banner made of a simplified version of Brazilian flag. The sinister supporter is a green wyvern, that was used, in Portugal, as a symbol of the house of Braganza. 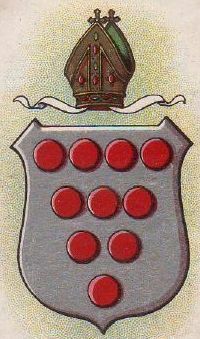 The first emperor of Brazil, himself a member of the cited house, used golden wyverns as supporters of his arms (and in his self-named order). 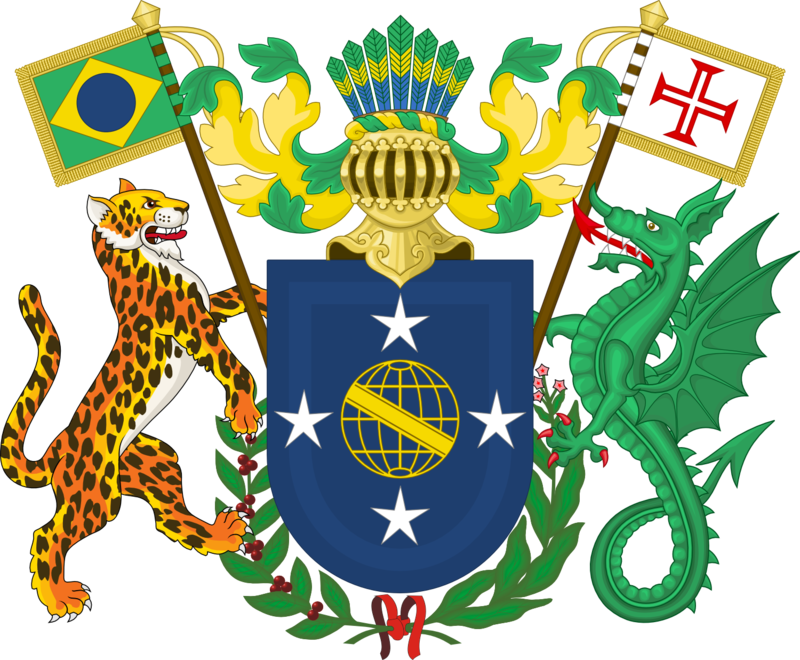 The dragon is holding a banner of the Order of Christ, that's generally regarded as the "first" flag of Brazil (see official timeline, in Portuguese). The helmet and the wreath are green and yellow, the main national colors of Brazil. The crest is an indigene headdress. I didn't use any motto, because Brazil officially don't have one: the empire used Independência ou Morte ("Independence or Death"), the current flag have the Positivist-inspired writing Ordem e Progresso ("Order and Progress") often considered politically un-neutral, while the current "coat of arms" have a simple República Federativa do Brasil ("Federative Republic of Brazil") as motto. 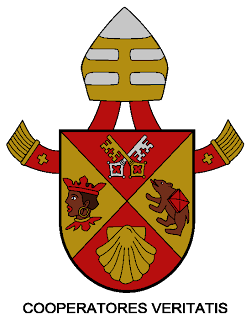 Although I see a heraldically-correct national coat of arms as a nice idea, I don't see any problem in keeping the current arms as, for example, "presidential insignia" for historical reasons. This is only a concept, therefore your comments, suggestions, etc. are welcome. 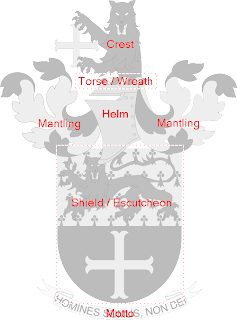 If you're not familiarized with basic heraldic vocabulary, this can be useful. Today, it was announced the six finalists to competition that will select the flag of the traditional county of Durham. My entry didn't form the selection of finalists, but I'll post it to spread the word about the competition. Although my design wasn't selected, I'm glad that all the finalist flags have similar themes to the mine. The official voting is open, and you can access it in the link (bottom of the page). The upcoming referendum about Scottish independence, to be held in 18 September 2014, has generated a doubt about a possible "rest of UK" flag. While many people say the UK flag won't change whatever is the result, we should be aware of the hypothesis of Scottish leaving the Union and the flag of the remaining kingdom being changed; if it occurs, what should be the best option? In the Yes-winning scenario, the remaining UK should be constituted of England, Wales and Northern Ireland. 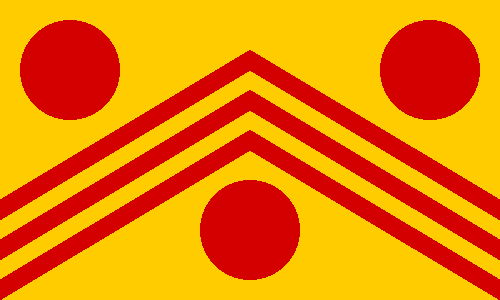 While the current flag represents the order of the kingdoms joining the Union, the design in the hypothetical could represent all the constituent countries in same way. 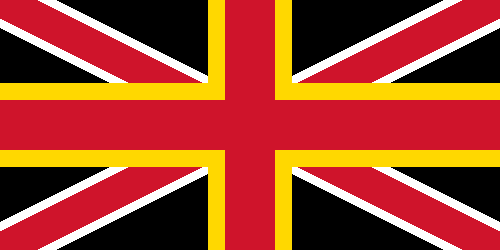 The yellow cross on black background represents Wales, the red saltire on red stands for Northern Ireland, while the red cross overall represents the England. If Cornwall eventually become a constituent country, part of yellow fimbriation can be turned white. 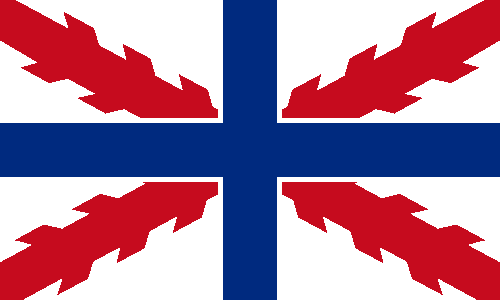 The saltire is completely red, and not counterchanged red and white like in current flag. 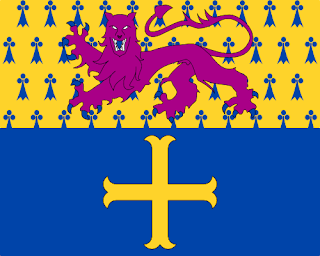 At least two other questions about vexillology can be resultant of the hypothetical scenario: the case of the ensigns and the royal standard. Ensigns: They don't need to be changed. For this occur, it only needs that, while the national flag is changed, the current naval jack is kept. 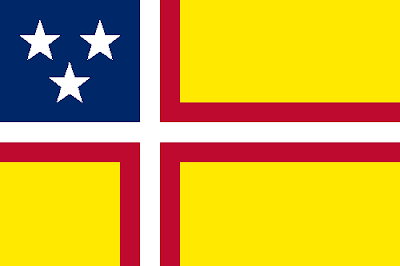 The now-independent countries that still adopt a British ensign (Australia, New Zealand, Fiji, Tuvalu, Cook Islands) can also keep it for historical purposes. Royal standard: It could be an excellent opportunity to Wales be represented in UK royal standard. However, its inclusion can be ambiguous, as the Prince of Wales uses the "royal" coat of arms of Wales (as used in Wales and in England and Northern Ireland). Other options are quartering England and Northern Ireland, or marshalling them, for example. As it's a very complex issue, I invite you to leave your opinion on the comments. This post is about vexillology, not politics. Comment gently, please. Per fess Or ermined Azure and Azure, on chief a lion passant guardant Pourpre armed and langued Azure, on base a cross moline Or. The draft contained a ultra-rare tincture (color) called Amaranth, between the pink and the purple. To avoid it being confused with Gules (red) or Pourpre (purple), I adopted the Pourpre tincture instead. The escutcheon is round in the bottom, the most used in Iberic Peninsula and Latin America. The lion is canting or punning ("Leo" is also an abbreviation of "Leonardo") and the lion represents many virtues in most of cultures. 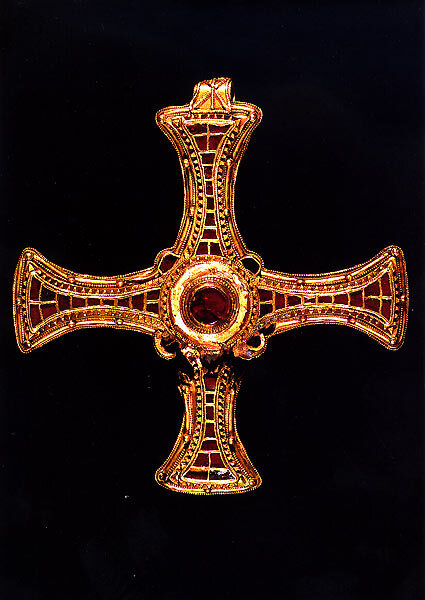 The cross moline represents my religion (Christianism) and is also one of the most striking heraldic charges, in my opinion. The ermine spots grants that my design is unique, as they rarely occurs. 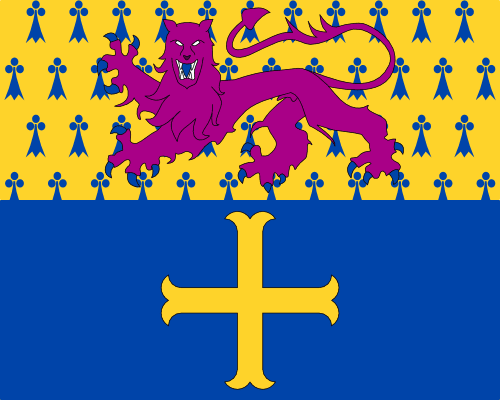 A demi-lion rampant guardant Pourpre langued and armed Azure, holding between the paws a cross moline Or. 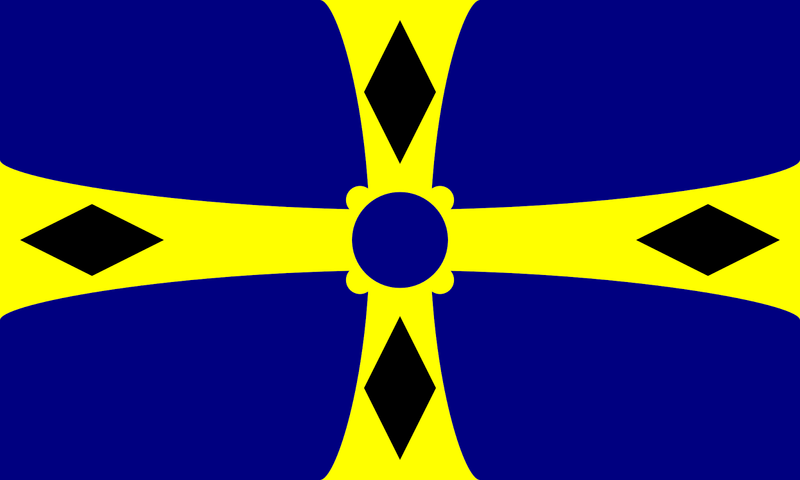 Mantling and wreath (torse): Azure (blue) and Or (yellow), the main dark and light colors of my coat of arms. Helmet: A gentleman (or commoner) coat of arms, to don't claim honors that I don't possess. Motto: "Homines Sumus, Non Dei" (translation: We Are Men, Not God). 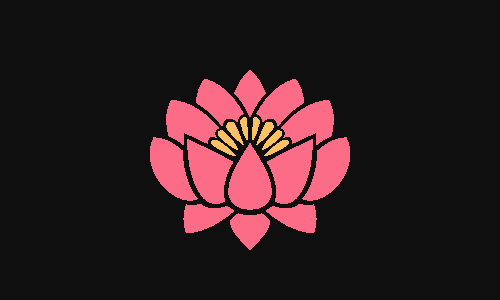 Represents the humility, one of the virtues I value the most, and the sense that we must be strong in all situations. 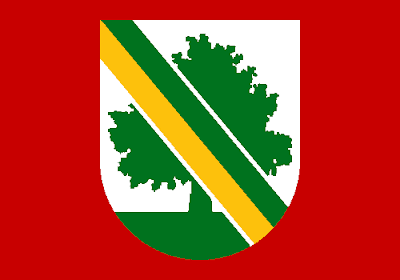 Standard: A simple banner of arms. The idea is use it in more ceremonial occasions. The ratio of 4:5 seems to a gentleman. Flag: To be used in less formal occasions. The base of the escutcheon. I know that a golden cross moline in a blue background was used in other occasions; for example, a Lord Molyneux used it on English Civil War, although the cross had a less modern design. 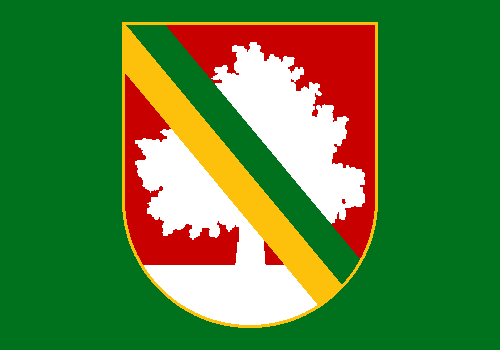 Where ambiguity can occur, the banner of arms can be used. Comments, suggestions, requests are all welcome with pleasure. 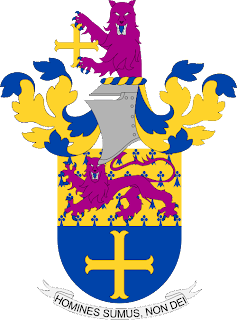 Very special thanks to Paul James and Samuel McKittrick from Flags Forum, of whom without the advices and guidance my coat of arms couldn't reach such quality. 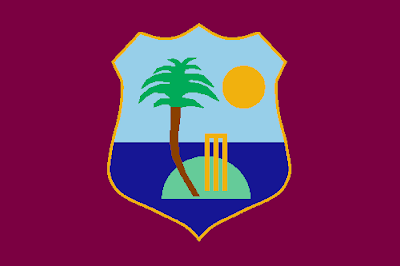 In cricket, many nations of Caribbean compete under "West Indies" umbrella. Most of its members belonged to former British West Indies, although it also includes American and Dutch dependencies. It's formed by six minor associations: Barbados, Guyana, Jamaica, Trinidad and Tobago, Leeward Islands and Windward Islands (the later two subdivided in smaller associations). For this purpose, the flag should be as generic as possible, as West Indies area is constituted by countries with their own diversity. But, if possible, it should resembles to WICB logo and, in lesser scale, the West Indies Federation flag. The wavy pattern and the golden disc comes from both the WICB logo and Federation flag. 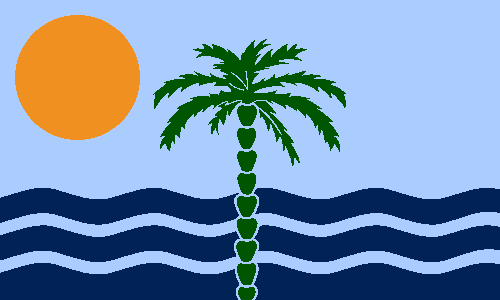 The palm tree is a feature of IWCB logo[ and a well-known symbol of the Caribbean. The sun disc was moved from the right to the left, to form a more equilibrated layout. This flag can be carried by West Indies fans, included as handmade pieces. There isn't any symbol that attaches it necessarily to cricket, being possibly used in other contexts. And this flag isn't copyrighted and can be customized. The blog doesn't have many posts related to Central Americas. I'm accepting suggestions. The then pope emeritus Benedict XVI was the first pope to have ever resigned since 1415. 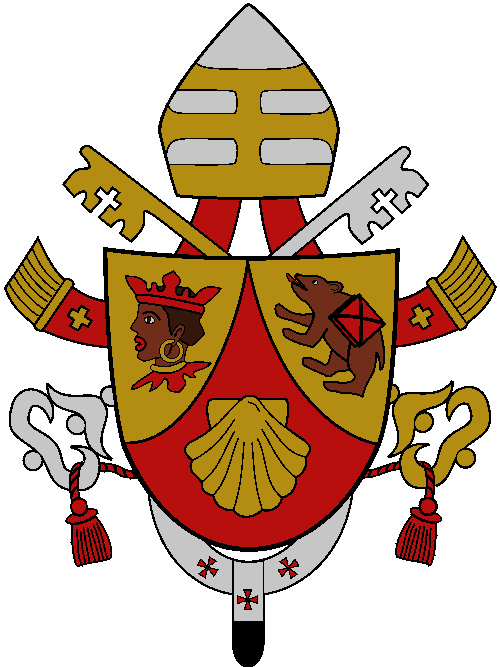 A new question was arose: how should be the coat of arms of a pope emeritus? the pallium, because the pope is a metropolitan or primate archbishop (in this case, of the Archdiocese of Rome), and to represent the collegiality of all the bishops. I'm not particularly keen of the cardinal's design. 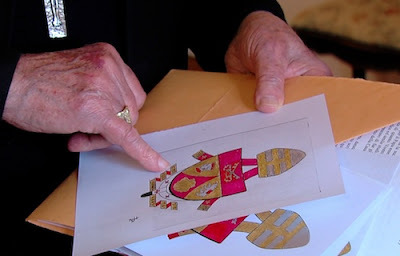 The pallium is never used by an archbishop emeritus, and naturally shouldn't be used by a pope emeritus. Moreover, I don't think that the red chief integrates well with the rest of the the shield. Here's my proposal. 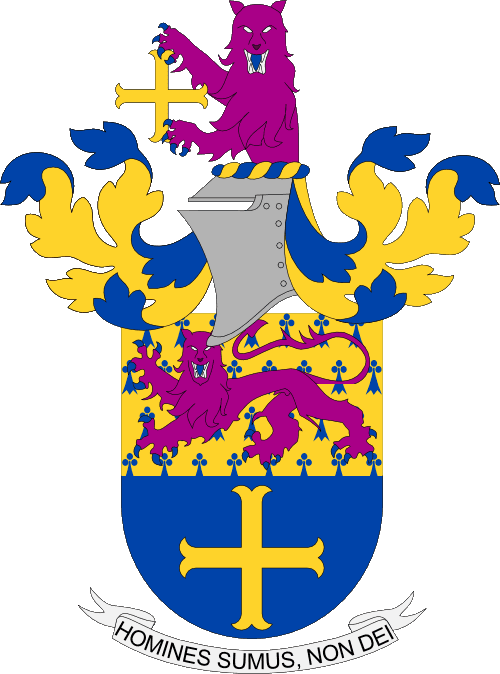 For the reason cited on previous paragraph, I don't think it's a good element to the coat of arms, with the additional reason that it doesn't combine with a round shield, that was preferred. The mitre can stay, as a consecration lasts all the life; even though the mitre is very similar to a papal tiara, it's still a mitre, and can be used as a special honor. 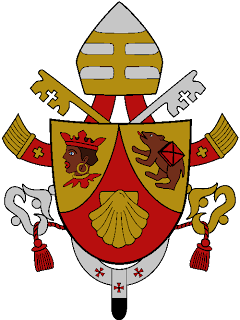 The papal keys are removed from the background and kept on the chief, as an honor, but, differently of cardinal's proposal, I kept the whole design in a way that could be traditional but still resembling current coat of arms. So I opted by the partition in saltire, that seems a sharp option for a now-quartered shield. The motto that was, for unknown reason, dropped from papal coat of arms can return. As religion is a very sensitive theme, I'd decided to write this post in a technical perspective. Prejudiced comments won't be allowed. I'd like to put the motto on a scroll, but my artistic abilities didn't allow me to do so. 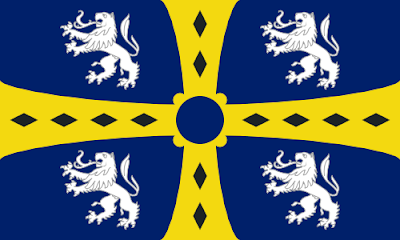 I like very much to write about heraldry! If this post have a good response, I'll write more about the theme.